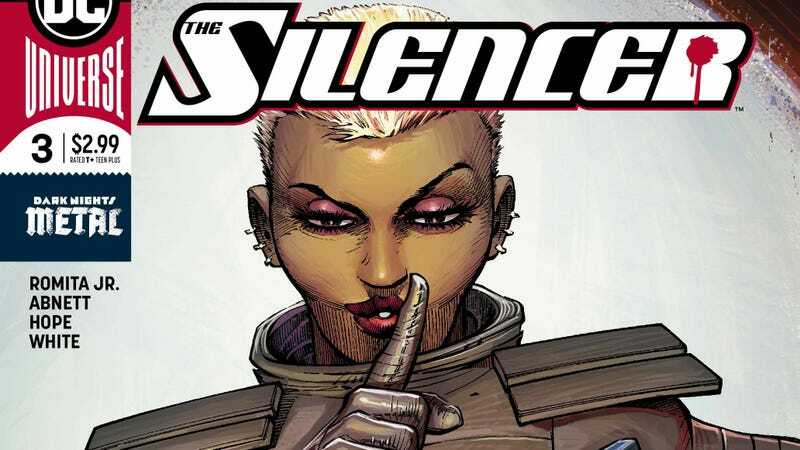 John Romita Jr. is one of the best comic book artists out there when it comes to over-the-top action, and the new DC Comics series, The Silencer, takes full advantage of his talent as it introduces a new assassin to the DC Universe. Part of DC’s “New Age Of Heroes” books, The Silencer teams Romita Jr. with writer Dan Abnett to pull Honor Guest out of retirement: When her calm suburban life as a mother and wife is interrupted by old enemies, she puts on her old gear and starts beating down anyone who threatens her and her family. One of the best things about the “New Age Of Heroes” titles is that they give artists top billing, not just in promotional materials, but on covers and interior credits as well. This feels very much like a response to comments made by Marvel executives last year that artists don’t sell books, and it’s refreshing to see DC elevate artists on these series. This exclusive preview of this week’s The Silencer #3 spotlights the thrilling energy Romita Jr. brings to this series, working with inker Sandra Hope and colorists Dean White and Arif Prianto to reinforce Honor’s formidable fighting skills. This issue is all about going bigger and bigger with the action, and the chaos of these opening pages is just a taste of how wild this story becomes. Romita Jr.’s compositions are so jam-packed with activity that it threatens to break through the panel borders, and while the fight is silent because of Honor’s trademark “zone of silence”, there’s loads of visual noise in the artwork to emphasize that this fight would be incredibly loud if Honor hadn’t pushed the mute button.